Last week, Downy invited me to attend the “Latinos Imparables” tour featuring Mexican American duo Jesse & Joy (they are currently promoting the album ¿Con Quien Se Queda El Perro?) The first tour date took place in San Francisco at the Regency Ballroom, and Lilo (Mexican singer-songwriter, Linda Lopez) was in charge of opening the show. 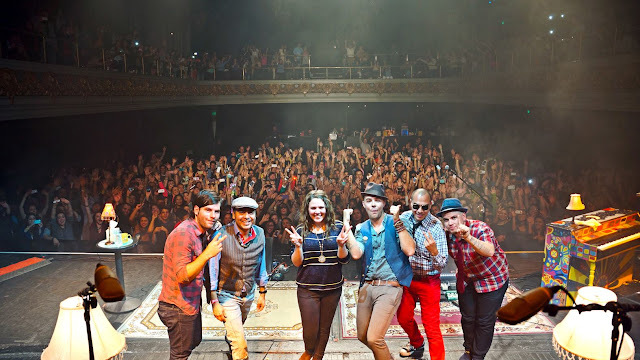 When Jesse & Joy came on stage, the fans went crazy! The duo’s set included songs from their latest latalbum such as: “Corre” and “Gotitas De Amor”, as well as songs from other albums: “Chocolate”, “Espacio Sideral”, “Quiero Conocerte”, and many others. After the show, there was a meet and greet with fans, and I was lucky to be part of it. Both Jesse & Joy were very sweet, accessible, and extremely down to earth – something quite refreshing in an artist. YOU, the fans still have the chance to win a meet and greet, the duo will have stops in Anaheim, LA, Houston, and other cities. For a chance to meet them, enter at Latinos Imparables. And, here are some of the photos from the meet and greet in San Francisco.